I would be doing literature a disservice if I didn’t first qualify what I’m going to say with the fact that I have never read Finnegan’s Wake. When I talk about insane books, it would be hard to leave it out, but I’ve not tried, so I have no basis of comparison. With that out of the way, I have to say that House of Leaves is perhaps one of the most insane books I’ve ever read. The book is about a documentary about a house that is 1/4 of an inch bigger on the inside than the outside. Actually, it’s a book about a druggie tattoo parlor reconstructing an academic book written by an eccentric old man he knew about the documentary about the house. The bulk of the book is a narrative of the documentary, along with the footnotes from the extensive amount of literary criticism, magazine articles and interviews about the film and its creators. 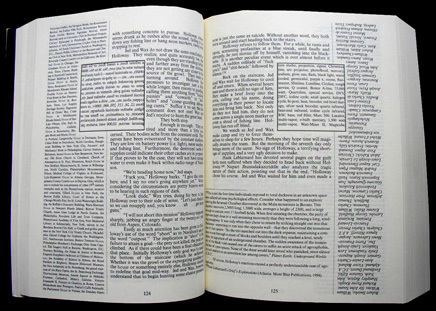 Unlike most post-modern books, House of Leaves is told more or less in linear fashion. But its various footnotes, upside down pages, footnotes that travel in a box through the page, the constant flipping of the book, the footnotes that have footnotes which also have footnotes, all leave the reader as lost as those trying to navigate the confines of a mysterious hallway that appears in the house. The exploration of these hallways is the bulk of what the film is about. Much like the Infinite Jest (though for different reasons) House of Leaves is not an easy book to read. Its author, Mark Danielewski, is known for experimenting with form. One of his books, for example, features two characters’ perspectives of the same events. It requires the reader to constantly flip the book to get both sides of the story. House of Leaves is like that too. The reader must constantly flip back pages, turn the book over, re-read for clarity, etc. All this makes for a very active reading experience. It’s also one that couldn’t translate to ebook (though supposedly it’s being worked on). It’s not something I would want to do all the time, but I definitely enjoyed the experience.